Bon’App Batteries – What Do YOU Think? Is the battery concept intuitive to you? Or is it hard to understand? 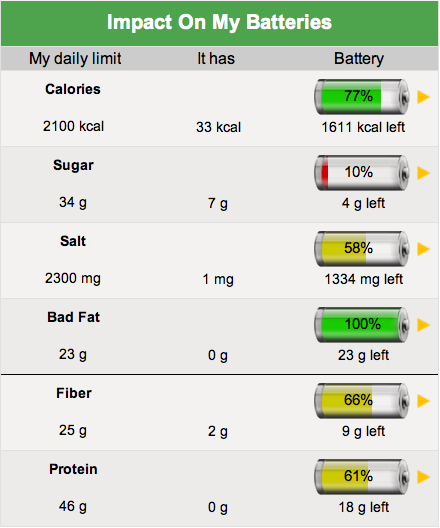 Do the batteries make it easy for you to see how food affects you? Do you have another idea for how food’s impact should be demonstrated? 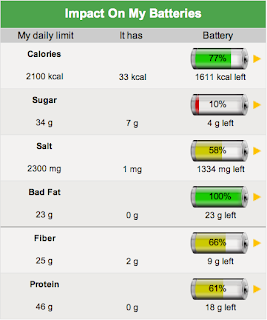 Bon’App uses the concept of a battery charge to represent Calories, Sugar, Salt, Bad Fat, Fiber, and Protein. 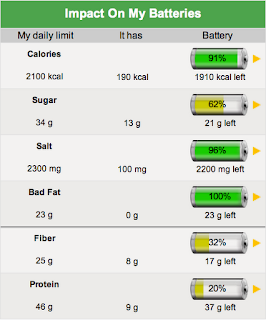 The batteries are divided into two groups: one group with Calories, Sugar, Salt, and Bad Fat (that even the causal has access to) and the other group with Fiber and Protein, that only registered users may access. For Calories, Sugar, Salt, and Bad Fat, the day starts with batteries fully charged GREEN and, as you consume food, the batteries deplete to turn YELLOW and then RED to show that you are nearing the daily limit. If you go over your daily recommended allowance, the battery turns gray and then black. 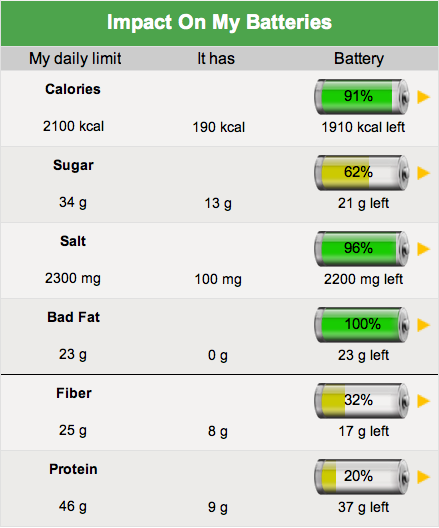 In the case of Fiber and Protein, batteries are displayed as "charging" as you log foods that contain these nutrients. These batteries start RED and then move to YELLOW and turn GREEN if you reach the daily-recommended level. We would love more feedback on this feature! Bon'App wants to hear from YOU! Leave your comments so we know what is working and what is not working for you. If you have a Google Account, LiveJournal, WordPress, TypePad, AIM, or OpenID it's quick and simple to post a comment below!